When I was a teenager, I would be at the pool every single day during the summer. Of course, I had a pretty nice body back then, before life hit me like a Peterbilt. And back then I was all about boys, so showing off my bathing suit, and what was in it, was sooo very important. I stayed out of the deep end, because I absolutely MUST have one foot on the ground at all times(a sensory processing issue) so I don't freak completely out. These days, I have absolutely no desire to be anywhere near a pool, for several reasons. First, I haven't swam in ages, so I am definitely out of practice. Second, I have exercise-induced asthma. Third, due to previous misadventures, aka being on a respirator, I have developed a strong aversion to anything that might inhibit my breathing. Fourth, I sunburn easily because my skin is extremely pale, and when the sun hits it just right I can probably be seen from space. And finally, I look simply awful in a swimsuit. I am not trying to garner sympathy by saying that I look terrible in a swimsuit. I am acknowledging a fact. Swimsuits just don't seem to fit me in the right places, no matter what size I try on. I've accepted it and moved on. I am not bitter; I have just tried to stay away from swimming and bathing suit competitions. And he wants me to take him swimming. 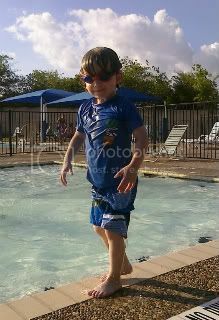 My kid doesn't just love the water to splashy-splashy and look cute. Zane likes to put his head underwater and 'swim like a fish'. He doesn't even want to get out of the pool when the lifeguards signal a break. This has required an adjustment on my part. I can't very well refuse to take my son swimming just because of my own reluctance. It would be wrong of me to visit my own anxieties on Zane, no matter how "reasonable". He is an adventurer at the moment, and I will not take that away from him. 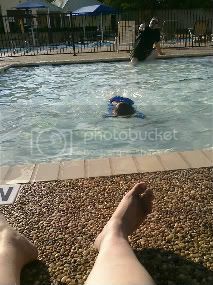 So I dug out a swimsuit, slathered on 4000 SPF sunscreen, and went to the pool with my husband and son. I even got into the water with them! The worst thing that happened was that I got sunscreen in my eyes. And that call from NASA about my being visible from space. I am considering the long sleeve rash guard from lands end...not so much for actual rash concerns as my surf board and wetsuit are, um, well "broken"? But then I would not have to worry about sunscreening my back, or much else of me, and I would think it would provide less wiggle room...or that whatever wiggled wouldn't be so apparent. My question is what do you wear under said shirt? An ill-fitting bikini top I would imagine...is that like having fancy underwear on? Hmmm...anyways you are great for getting everybody to (and in ) the pool! It's amazing what we'll do for our kids. Even last night I was eating the last bit of ice cream and the kids came up and I had to give the rest to them. Before I had kids there was no way on this earth I was giving my ice cream to anyone!!! Now I do it without flinching. Mine tried to go swimming in her baby bath tub last night! It's harder for NASA to identify my land mass when I wear a large hat, sun shades, and full body armor. Lacking the armor, I pretend to have lost my swimwear, and don board shorts and a tank top. You would be amazed what those things cover up. From one pool aversioner (It's a word. Don't look it up, just go with it.) to another, trust me on this.